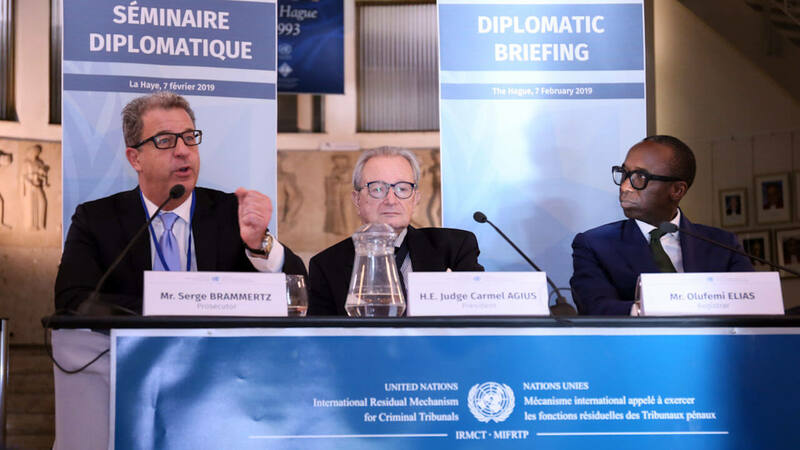 During the briefing, which was attended by some 100 ambassadors and members of the diplomatic corps, President Carmel Agius, Prosecutor Serge Brammertz and Registrar Olufemi Elias provided an overview of the Mechanism’s activities. The Principals of the Mechanism also thanked State representatives for their steadfast support to the Mechanism since its inception, and identified several areas where continued support from Member States remains essential. These include locating and arresting the eight fugitives indicted by the International Criminal Tribunal for Rwanda (ICTR); the remaining transfer of those convicted by the ICTR or the International Criminal Tribunal for the former Yugoslavia to an enforcement State; and, more generally, ensuring that the Mechanism has sufficient budgetary resources to undertake its work.